Two or three mornings ago, I was exiting the grocery store. Evidently, I had just missed witnessing an accident in the parking lot. A younger female employee from the store had backed into the side and rear end of an elderly gentleman’s car as he drove through. Although the gentleman’s car was already scratched and dented some, the woman’s car was less damaged. There was slight damage to both cars from bumping. Both drivers exited their vehicles. Much to my pleasure and hopes, after a few exchanged pleasantries, both got back into their respective vehicles and went about their business. This is exactly how many of these encounters should end – but we’ve seen most of them morph into tedious bureaucratic wastes of time. I wish that we weren’t so focused on the small stuff about our vehicles. They should be primarily to transport us safely and comfortably from place to place, rather than be worried about so much. A few dents and scratches are normal for a car well used. Not only would our insurance be lower if more people stopped worrying about the lesser cosmetic defects on their vehicles, but it might make some people happier. For this card, I bought a random category and then put my cousin’s picture on the front, drawing a low-tech beard, then scribbling out the words as needed on the inside. For most of my adult life, I have tried to be goofy with greeting cards. Sometimes, I have inadvertently shown bad taste doing this but since I’ve never been known as someone with great taste, I don’t think I’ve damaged my reputation too much. First, if you want to have a little fun, you should deliberately buy the wrong occasion card for someone. For instance, instead of a birthday card, send a sympathy card. Instead of a graduation card, send a bar mitzvah card. After a couple of times doing this, people will either laugh at your efforts or start expecting it. Many times, the crazy card that doesn’t conform will be the one remembered. Cards are usually so quickly forgotten that anything memorable about them is quite a feat. Fifth, you should consider changing the words already written inside or on the card. Subtle changes can have a huge, humorous impact on the card’s intended meaning. Second, if you are going to write a message, write it on the front of the card where people are reluctant to write – or on the back. Even better, write your message upside or wrapped around the edge between front and back – or any combination thereof for maximum effect. First, write a totally wrong name on the card and/or envelope. Third, write messages from people who don’t exist. Sign their name, too, make up fake shared experiences, or write a message as if you are a famous historical person. Write the message as if you are either totally serious or mentally deranged. Another easy and creative way to personalize a boring card is to print a picture of the person and tape, glue or include it in or on the card. People get caught off guard when this happens and usually appreciate the little touch. If it is someone’s birthday, put a picture of them when they were very young. On the other hand, put someone a picture of a total stranger in the card to bewilder both the recipient and anyone else looking at the card. While it is true that greeting cards can be quite boring, the reality is that is our own fault that they lack any spark or zest. With just a little creativity, greeting cards can be fun and interesting. Let’s Obsess Over Our Vehicles, Shall We? I’ve written before the issue of acceptance of the deterioration of ‘things.’ No matter how cool and interesting your new thing is, time and entropy rules over it. You’ve also been subjected to my dumb personal opinion about the obsession with personal vehicles. I don’t understand the “pride in ownership” argument in regards to cars. All I want is something that is reliable and comfortable. If it were zero emissions and sustainable, that would be pretty nifty, too. If someone offered to sell me a perfectly reliable car at 1/2 price, yet insist on spray painting it 16 crazy colors, I would not care. Wheel covers don’t match? Don’t care. Seats are all different? Doesn’t bother me. Not only would it be easier to locate in the parking lot amidst all the pristine, over-priced cars, but I could paint over a scratch at almost zero cost, put any part on it yet still claim that it matches, and have something interesting to look at. Most people who seem to love their cars don’t take a minute to think about the fact that a million other people have cars exactly like theirs, down to the leather seats, alloy wheels, and sunroof. Exact matches. Yet their specific car, the one which looks like most other cars on the road, somehow adds a special zest to their life? Hmmm… People get mad at me when I talk this to. If I ever thought to myself “Man, I need to go wax my car,” I might decide instead to drive it into the river. I don’t care if it hails or storms unexpectedly, especially since my ability to control the weather is not one of my skills. I’d prefer to not have windows shattered or get hurt when it hails. But I would never lose my mental stability simply because ice falls from the sky and damages my personal vehicle. For all of you who are normal and disagree with me, come walk on the dark side with me. Your day can be ruined without notice. You can worry about going on with your life for fear of your car being damaged by something totally out of your control. A stray shopping cart can roll across the parking lot and mar your immaculate baby blue paint job or scratch the trunk of your vehicle. You drive around, searching for at least minimal coverage for your car, instead of hopping out and getting to your destination. You move your vehicle four times to gain optimal protection from the potential of damage. And then a tornado, flood, fire, thief, careless driver, or falling tree reminds you that your vehicle is just a thing, designed for a specific purpose. All your obsession has done is expose you to loss. Yes, a car can be interesting to look at. But I think our world will be a better place when people stop concerning themselves with their personal vehicles. We’ll be able to live more cheaply, pay less insurance, and focus on living and doing, rather than protecting stuff. I know I probably bug people with my contrary attitude. All I see if a means of transportation. I don’t think my car reflects on me as a person, whether it is a BMW or ’76 Pinto. I still am missing the male gene that requires any member of the human race who also has facial hair to be concerned about his vehicle. (Which might include the occasional female or flannel-wearing member of our species.) This includes the size of the engine, whether it can traverse a 20-foot deep water-filled ravine in mid-December, and how new the model is. I don’t care. Does it accelerate decently without using more gasoline than a 20 year-old arsonist? If so, I’m fine. If it has good air conditioning and a radio, even better. I would give up ALL aesthetics of my automobiles in exchange for reliability. All of it. It could be the ugliest monstrosity this side of Wyoming and as long as it afforded better mechanical reliability, I would welcome it. Being able to easily find parts and mechanics is of greater practicality to me. I’ve never been one to care much about cars, nor about upgrading and tricking them out. If it has the modern conveniences and decent gas mileage, all else is irrelevant. I had thought that aging might perhaps bring out the macho concern in me, but it hasn’t. When I’m working around younger men, it still amuses me to hear them talk about variations on their self worth being tied to the desirability of their vehicles. Imagine if we had 5 or 6 varieties of vehicles. Not based on model or brand; rather, based on utility. Most of us simply need an affordable sedan with good gas mileage. All else is secondary and drives up the cost. The super rich could then just have their vehicles specifically made, leaving us boring folk to take advantage of the reduced costs associated with having fewer vehicles. As for vanity modifications such as pin stripes, wheels larger than a small house, chrome bumpers, or canopy running lights, just tax those. I can see my plan being very popular with those who enjoy flying a rebel flag on the front porch. While I can appreciate a nice vehicle, our obsession with cars is one of the reasons our society is so complicated and expensive. Yes, I’m trying to make a minimalism point here. My car doesn’t reflect on who I am. It doesn’t “give me pride,” a phrase I loathe hearing about vehicles. But if you have 24″ tires or more than 2 square feet of chrome in unusual places on your mode of transportation, you probably disagree with me. Although not considered a joyous topic, everyone who knows me should know that I want to be cremated. Preferably once I’m dead, in case someone wants to get things out of their proper order. Like most people, I have a few detractors who would gladly reverse the order. Were I born a few centuries ago, I would have been one of those heretics burned at the stake, saving several intermediary steps. Somewhere around 100,000,000,000 people have lived and died on the planet, with around 7 billion now walking gleefully about. Imagine all those graves! Imagine our population growth and the future acreage that would be needed if we were to continue to bury people individually in plots, as we do now. There are websites you can visit which will visually demonstrate the size of cemeteries for one billion people – it is surprising. Assuming no other alterations to our world population, it is a certainty that burial will not be possible at some point in the future. Being buried is another one of those bizarre things to me. Taking up valuable real estate when I die is not my idea of sensible. Even being buried in an allegedly impenetrable concrete (or steel) vault only slows the inevitable fact that one’s body will turn into sludge and decompose. If you want to amuse yourself when I’m gone, definitely bury me intact. If there is the remotest chance of me haunting you after death, such a decision will guarantee that I visit you with evil intent after my passing. Paying for all the extra pomp and circumstance is eliminated with cremation as well. The cost is not the bigger issue to me – it’s the attempt to conserve what must decompose. No matter how much effort we expend to memorialize someone we love, time will erase all of our vestiges of honor. I think it’s more important to celebrate our time here while we can and preserve the memories and mementos of the people we love. If we are careful and do it in a loving way, such archived memories can easily survive forever. Human flesh and even stone all succumb to time.No matter how mammoth your memorial, it will disappear in time. Once cremated, place the ashes in a simple box and scatter the ashes. Putting ashes of a loved one in an urn is better than burial but still strange for me. Spending lavish amounts of money on an eye-catching urn doesn’t indicate a greater love for your lost loved one, just a larger bank account. No matter how much you treasure the ashes, you will then worry about who will care for the ashes once you’ve passed. Each thing that must be treasured weighs down those who follow us. Embalming is another anachronistic relic leftover from earlier times. By avoiding burial, embalming is eliminated as well. Less chemicals, contamination, etc. Even if I were okay with being buried, I could care less about being embalmed. Wrap the body in a sheet and plant it, without all the intermediate materials, processes, chemicals and hassle. That custom here dictates that we almost must use a casket is another weird thing to me. The casket, too, will decompose. Its alleged beauty is for the brief interlude between your death and burial. Putting a perfectly good quantity of metal, wood, and artwork in the dirt for no good reason is just weird to me. Paying thousands of dollars for the privilege of seeing it for a couple of days is absurd. Save your money and leave it to a friend or family member – or a charity. Or give it to the IRS – anyone other than planting it in the dirt. I’ve found that a lot of people have never had a comfortable conversation with anyone about this type of topic. True, they might have had a quick, inadvertent talk with someone at a funeral, or done so while making funeral arrangements, but most people simply haven’t examined why they do things the way they do in relation to death.Many people will only look at death through the squinted corners of their eyes, as if contemplation of its shadow in their own lives will hasten its arrival. It’s an anachronistic viewpoint. This tendency leads to much family discord and financial issues that should easily be sidestepped. From a very early age, burial seemed bizarre to me. When my grandpa Cook died is the when it really hit me that pretty much everyone else didn’t mind going along with tradition. His death was the first that clicked with me mentally and that we were putting people’s bodies in the ground. I had walked around the White Cemetery in Monroe County when I was young. Grandpa showed me several graves and told me stories – none of which do I remember. I do remember him reminding me that there was nothing to fear there. It was a common theme for him when he was talking to me, that men were the problem in most cases, not unseen ghosts or forces. As far as I’m concerned, regardless of the circumstances of my death, if you would rather wrap me in dynamite and detonate it, that too would be okay with me. Especially if it’s on the internet. And you can sell the fuse lighting privilege to one of my detractors. Make even more money from the event. Before asking “Who is this idiot?” please remember that most people can’t write significantly better than you or me. When you factor in that many funny and insightful people can barely write at all, the issue becomes less important. I’m no Pat Conroy, nor do I aspire to be. But at least I don’t have ‘blank page syndrome’ like almost everyone I know. It’s easier to say nothing and hope no one notices you in your dusty corner of the world. Are we afraid that people will ridicule us? Don’t they already? And the ones who are most likely to ridicule are people that are just plain annoying anyway. Is someone a writer when they are paid to do it? Only when they are paid or when they earn most of their living doing it? Most people aren’t smarter than you or me, either. They probably are REALLY smart about a subject but this specific education doesn’t translate into unilateral respectability. Everyone seems markedly smarter than us – but it’s not true. I’m still finding out that most people I think are geniuses secretly believe in some crazy stuff like paranormal hauntings, aliens, or religious dogma involving magic underwear, transmutation, etc. For the record, being well-versed in sports trivia is a mark against you. Sorry, but it’s true. Start writing blogs or important emails with no intention of polishing or “perfecting” the content. Get your basic idea across and then stop worrying about filling in the cracks. You are going to be misunderstood anyway. Just like in real life. In my case, Mike Hignite and his mom (and his mischievous brother Jim ) were people who literally allowed me to survive on several occasions. They certainly were responsible for many of the truly great happy moments of my childhood. I first saw Mike Hignite playing outside a nearby trailer. Unlike most people, Mike didn’t insult me or make a face when he saw me the first time. I was poor, dirty and had fingernails bitten down to the quick. Mike smiled at me and we played catch. Watching him grow up, I’d like to add that his approach hasn’t varied much and the term ‘fast friend’ more than casually describes his outlook on life. Had Mike and his mom not been in my life, I’m certain that my life would have been an even bigger disaster. Mike would be one to underplay the truth or significance of my belief. He had witnessed the malignant stupidity of the violence and substance abuse of my family repeatedly. It took me a lot of work to keep Mike shielded from just how bad the violence and alcohol had infected my family. There were times I was certain that I was about to be killed. Many of those times ended with unexpected sleepovers at the Hignite house. Mike was poor and aspired to find a way to be someone and be happy doing it. I, on the other hand, had honestly given up hope of a good life but used Mike and his family as a template of what might be possible. The longer I grew to know Mike, the more ashamed I became of my life. That is hard to admit. Not only was I increasingly sure that I wouldn’t survive to adulthood, but I felt infected by the sheer incivility if not downright evil I was immersed in. I found myself working harder and harder to not tell Mike things. For some of these tings I was convinced he would either shriek in terror or disgust or worse, not believe me at all. Before I forget to tell one of many stories: one Friday night I escaped to Mike’s trailer without making arrangements in advance. Mike, his brother Jim, his mom Barb, and her boyfriend Hub were eating at the table. Honestly, I don’t know how I lied in a convincing way, but I went in and asked if I could stay the night. When Mike’s mom said “Okay,” (as she inevitably would) I went into the end bedroom and basically had a nervous breakdown. The Hignites didn’t know is that I had been in my bedroom reading “The Chronicles of Narnia” when dad came home. (I was as far away from Narnia as could have been possible.) I could tell dad was drunk when arrived just by the way he had been revving the truck and how he slammed the truck door. (Abused kids learn quickly to gauge the impending storms.) Within moments, there was screaming and then shattering glass. Mom was yelling my name and without thinking, I ran down the long hallway and into the kitchen. Dad was sitting on mom’s chest and shoulders, holding a pistol to her face while pulling her hair. Mom was screaming at dad to pull the “f#$%ing trigger.” Dad looked up at me and then pointed the gun at me. Honestly, I knew for a fact that he wasn’t going to be happy until someone was dead. I ran back down the hallway. The back door was on the right and I flew through, not even bothering to try to shut it. After a few minutes of crying, I ran over to the Hignites. That’s how I ended up in the back bedroom, internally hysterical, wondering if anyone had been killed at my house. If the Hignites had not been there, I think that I would have simply kept running, maybe forever. As with all these stories, it sounds far-fetched. Mom would have denied it under oath. Besides the fact that the Hignites lived in the trailer park, the truth is that it didn’t occur to me to even try to go anywhere else except there. It was a “safe” place for me. I never told Mike or his mom this story. The above story is just one of many. This story isn’t about the violence or that part of my life; understanding it, however, is a prerequisite toward appreciating how damaged I was – and how important it was to have someone like Barb welcome me so often into the safe haven of her home. The Hignite family somehow survived through tough times and came out with a strong faith in god and each other – something that was definitely not the case in my life. When I thought of what peace might look like, it was Mike’s mom and the family home she provided that would appear in my mind. I would have done anything to have lived at the Hignite house. I would have disowned everyone in my life to have been given that opportunity. Mike’s family was poor and his mom’s frugality led to some interesting stories (for later consumption.) The difference in Mike’s house was that his mom worked two jobs to support her family and her decision to live a different, better life. His mom didn’t spend her hard-earned money on drinking or frivolity. She looked directly at her kids when she talked to them, even if the talk preceded punishment. Punishment wasn’t just a threat with her, either, but she exercised both discipline and control, something else I was unaccustomed to in my life. That had a huge affect on how I learned to watch people treat other people. His mom did her best to keep track of Mike and his brother and was genuinely interested in their welfare. In my case, it became clear that mom was more adept at playing the role of mom when it suited her or when appearances might matter. Mike’s mom instilled in him a powerful work ethic and an even stronger desire to expand the intelligence that he and his brother were obviously born with. Because of Mike, I started in band. I think I’ve written many times how being in band gave me access to a larger world that I otherwise wouldn’t have experienced. I started running after the 9th grade after watching Mike play sports. I played two games of little league thanks to Mike and his mom; those two games were my only experiences with organized sports. Later, when my family’s trailer burned to the ground, I was scared senseless to not be able to have the Hignites nearby. I always felt more at peace and at home at their trailer than I ever would around my parents. Being forced to move away after my family’s trailer burned drastically changed the course of my life. I’m convinced that more optimism would have flowered within me and more doors would have been opened for me, if only the Hignite family influence would have lingered longer. Over the years, I have written Mike Hignite’s mom several letters, trying to bridge the gap between a sincere thank-you and over-the-top explanation. It’s a shame that I never finished a letter and then mailed it. I finished several but they always ended up in a drawer. I didn’t know how to say thanks in such a monumental fashion without being negative about everything else in my life and about my childhood. There was no way to express how grateful I was to have had her around without also condemning everyone around me. In my mind, a sincere letter should be complimentary in scope and without reservation – and in the case of Mike’s mom, I couldn’t say “thanks” without a long explanation. She certainly knew that things were bad, but I’m not quite sure she knew that my life literally was in danger more than once, had it not been for her welcoming arms. Truth be told, I also didn’t relish the idea of catching Mike’s mom off-guard, such as running up to her unannounced and basically tackling her in a bear-hug of gratitude. It has been difficult for me to learn to effectively express specific emotion. I’m not putting Mike’s mom on a pedestal or conferring magical powers to her. Instead, I’m thankful for all the times she tolerated me even she was bone-weary of working two jobs and of listening to our loud boisterousness. Mike’s mom probably never understood that this type of normal living, carefree and full of both joy and work was not something that I knew to be possible in my daily life. I went to see Barbara in 1990 after she had given birth late in life. She was starting a new life even after having packed a full life into her first forty years of living. I tried (and failed) to say “thanks” in an appropriate way that would convince her how instrumental she had been in getting me to be able to survive to adulthood. I was still too young to see that life is indeed fleeting and that it’s best to say the words that need to said while you are feeling them. Seeing her starting a new life when so many other people would have been worn down by life made me very happy. As I’ve aged, my perspective has deepened immensely. I think often of Barb and of how easily my life could have been something drastically different. It’s impossible to know how much of an impact that Mike’s mom ultimately had on me – but it is a certainty that her presence hung heavily in the balance sheet of my life. I recently came back to this fascinating person, after someone online pointed me to an online community which was riddled with misremembered history about Dr. Pardo. I’ve become accustomed to people’s vague memories, as it is something I struggle with myself. It has taught me to be skeptical of much of what I think I know to be true. I’m sure that even I have details wrong but I’m on guard against believing that history has obscured some things from total clarification. Dr. Pardo’s office, at least where I remembered it, was past the Monroe Baptist Church, in Monroe, Arkansas, on the opposite side of the road from the tavern. He supposedly traveled around at least 3 counties. Dr. Valentine Pardo (he was listed as “Valentin” on travel manifests) studied to be a dentist and a doctor. He was born in Placetas, Cuba, in 1902 or 1903. Having both skills was invaluable for such a small community. He had left Cuba when he was 18 and arrived in the U.S. on the 23rd of June, 1920 to live in New York and get his dentistry degree. After about a year, he decided to become a medical doctor and went to Kansas City to earn his medical degree. When he got it, he came to Arkansas to practice. When the U.S. government hired him as one of a group of doctors to go to East Arkansas, it was to help fight disease on that side of the state. The story is that he would make house calls and would drive by jeep or mule. Many times, he accepted payment in any way a person could afford to make it. One of the stories I do remember is that he never turned anyone away for not being able to pay him. He delivered around 5,000 babies, as well as doing dentistry, too. When I grew up, I was pleasantly shocked to find out that he was Cuban. This, too, was quite a revelation and explained how foreign and surreal his voice sounded to me as a child. 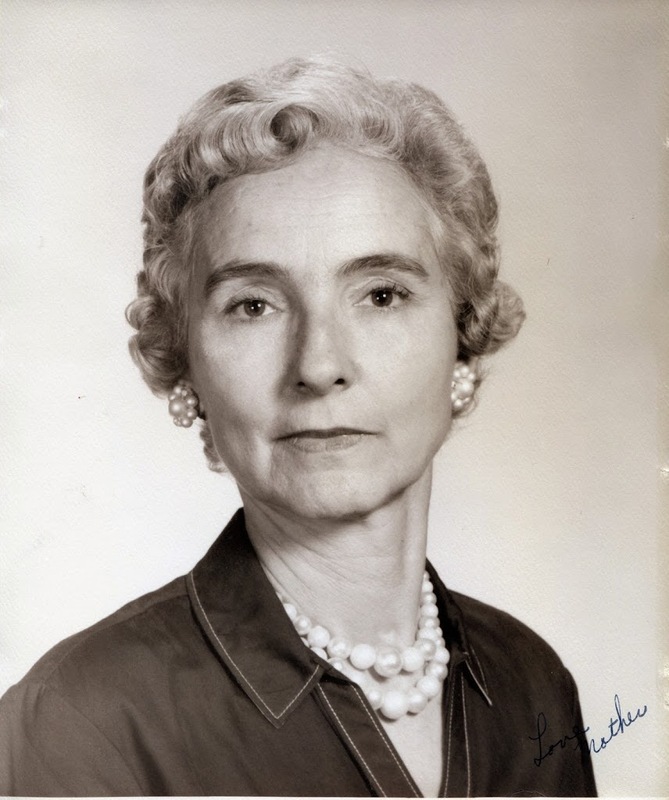 To be Cuban and end up in Monroe County seemed like the most unlikely thing in the world to me.My grandma visited Dr. Pardo quite often to get her “pills.” I didn’t get to hear him speak very often, but when I did, his voice sounded exotic to me. I remember listening to one of my aunts and grandma talking about him, telling stories of him traveling late at night, in storms, or just about any distance to help someone. I know that he lived until around 1996. One of my biggest “misses” as an adult was not looking him up to talk to him about his life. I’ve always thought that his life would have made an ideal book or maybe even a movie. One of the biggest myths about him was that he wasn’t licensed to work in the state. It isn’t true. Anyone so inclined can visit the state’s archives and find his medical license and information. Maybe the myth is more interesting. I’m not sure. The misconception lessens his effort to realize his American dream and put down roots in eastern Arkansas. My paternal grandmother: Harriet Charline Mull, born on 23 Oct 1917. My paternal grandfather: James Arthur Terry, born on 07 Jun 1908. They were married on 26 October 1931, plus or minus a day. My grandmother would have been 14 years and 4 days old. My grandfather would have been 23 years, 4 months and 20 days old. If you enlarge the picture of their marriage license, below, you will note that it erroneously indicates that she was 15 years old at the time, for whatever reason. She wasn’t. She had just turned 14. 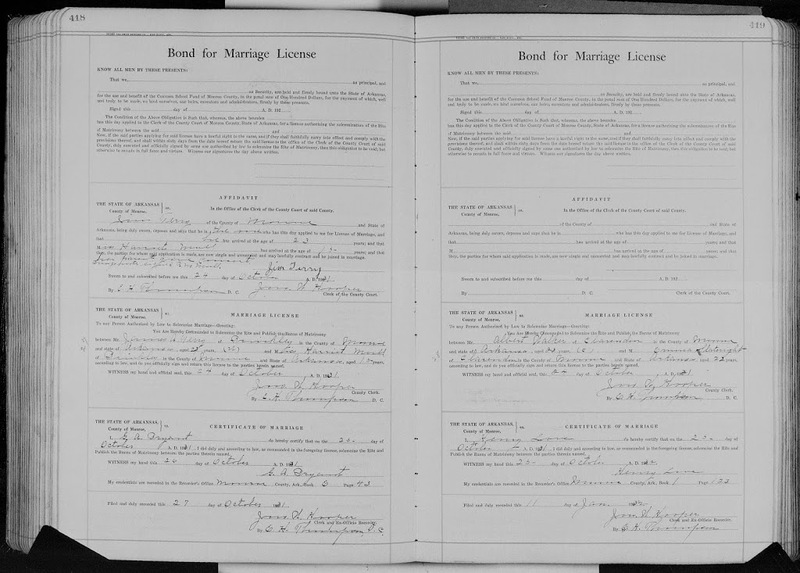 There is also a signed affidavit above the license, indicating that grandmother’s parents gave consent for the marriage, although their signature isn’t on the document. We can further pinpoint her age, even if oral accounts differ. The 1920 census page for my grandmother’s family is above. 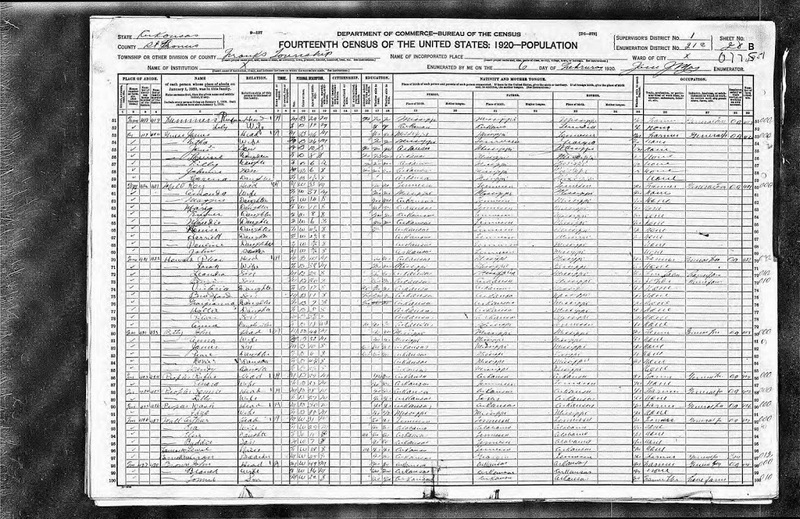 The census sheet is dated 06 February 1920. This means that she was 2 years, 3 months and 15 days old on the day the census sheet was completed. If you look closely, the census sheet has her at around 2 6/12, which is close. Her social security index and tombstone also all agree with these dates. The purpose of this post isn’t to attempt to draw attention to her marrying “too young” or anything of that sort. It’s to document that people should stop and look deeply into their family trees to see how their ancestors lived and not only ask about the superficial details. All of the interesting stuff lies much deeper than the superficial details found in the average family tree. Why did grandmother marry so young? Why was grandfather so much older? Was a pregnancy involved or some other factor? I’m assuming that my grandfather well knew that she had just turned 14 instead of the 15 indicated on the signed affidavit. Maybe another family member knows and would perhaps share the ‘story’ of this with me. But probably not. I have a lot of dates, facts, and sources for her life but not too many stories which enrich the story of her life. Her memory is fading as people inevitably take their own places in the inescapable hall of memories. It doesn’t have to be that way, but most people aren’t forthcoming with their own genealogy efforts or with their stories. Have you ever had a mystery revealed to you? Even when you know you aren’t going to comprehend fully, you get a glimpse of what it might feel like to be satisfied with your own mind? Reading this book was like that for me.Such a book overshadows your days, lingering at the edges of everything you say and do. For anyone unfamiliar with such a feeling, I would ask that life allow each of us at least once to be so overpowered by the written word. I’ve never been one to concern myself too much with book genres; I find that ‘interesting’ and ‘not interesting’ are better expressions of the content of a book. While this separation seems a bit too generalized, each of us is also governed by where we are in life as we experience a new book. I think that TFIOS is one of the few novels that will touch you regardless of your circumstances. I wish that I would have read this book when it was first published. It would have been such a boon to use the humor with my cousin Jimmy and others. How other people who’ve lost people to cancer might avoid being overwhelmed reading this book is beyond me. Whatever your temperament, you can’t “just read” this book and not immerse yourself in issues beyond the book. It is personal, much like the way John Green describes the cancers his characters live and die with. I’m a late arrival to the John Green bandwagon. For whatever reason, I’ve always read his words in bursts on the internet, even at the expense of not watching him and his brother on their online presence, or of reading his novels. Despite my lesser writing ability, I see an affinity with the unexpectedness clever preciseness of his writing. Even though I bought the book for interim reading on a recent trip to Hot Springs, I found myself gleefully abandoning the facade of the real world for the quick-witted, emotional world of The Fault In Our Stars. Few books have hit me with such explosive force. It compares equally to A Prayer For Owen Meany in punch. While the latter’s world is more complex, TFIOS is a rapid succession of both emotion and wit. For those who have lost people close to them to cancer, it not only will make you laugh at the serious absurdity of it all, but challenge you to not cry. For it to have been written by someone not scarred by cancer, it is a testament to John Green’s intense style.Regardless, you will yearn for a world inhabited by people as smart and interesting as Hazel Grace and Augustus. As you walk around your real life while consuming this book, the people you encounter will suffer by comparison. For the five people who’ve never heard of “TFIOS,” I would ask you to forego the usual clichés and give this book a try. 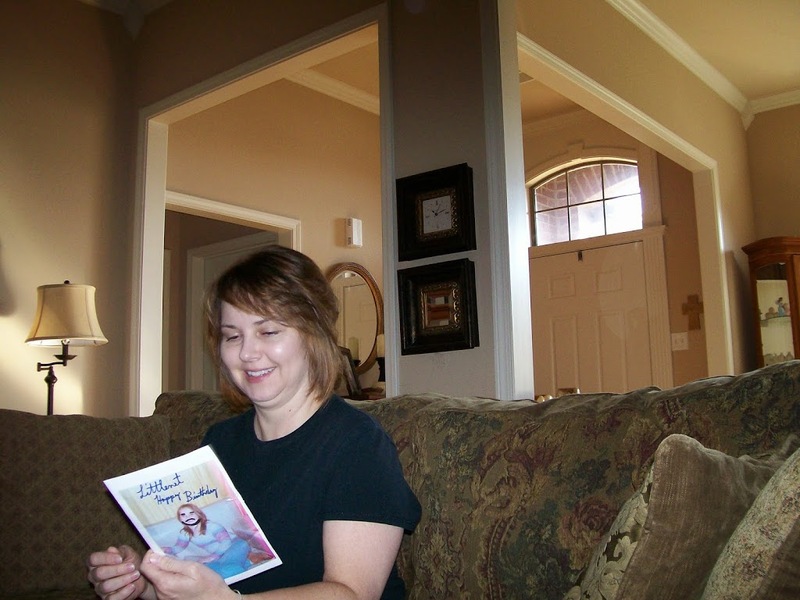 Whether you are into clever banter or engaging story, this novel should satisfy anyone. I’ve heard some criticism of the movie, as it allegedly veers too harshly into shmaltz. With the novel, John Green writes with such clever insight that you’ll find yourself wanting to earmark pages for re-reading and sit alone with a cup of coffee, pondering the issues it will free up in your mind. For whatever reason, reading the book will spark 100 distinct bouts of creative thought and leave you wondering why you couldn’t have shared the world described in the book. At its heart, the book is devastatingly harsh, but always true, and always resonates.